A proprietary accessory which facilitates signal cleaning from ambient microwave pollution to improve the performance of your hifi. 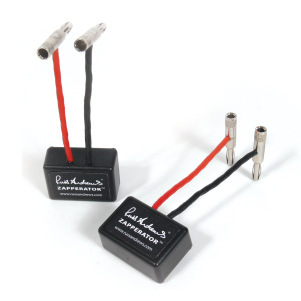 Its called a Zapperator, and plugs in-line to the end of your speaker cables as they enter the speaker. You may be aware or unaware of the war being waged on your hifi equipment by RF, or Radio Frequency. All metal wires – interconnects and cables in particular, act as radio aerials, picking up broadcast signals. They are behaving in exactly the same way as your actual domestic radio and TV aerial, they can’t not do, it’s how things work. As a result, it is argued, the musical information passing through the wires is contaminated with low level radio signals. This will affect the most vulnerable parts of music – the attack and decay of notes and an overall lack of clarity which is lifted when RF is removed.That’s the theory at least. The second line of defence is to provide a sink into which any residual RFcan be dumped – especially at the speaker end, which has its own RF-attracting internal wire. That is where the little zapperators come in. In my system, yes. They have definitely helped enable better control of bass, resulting in improved balance between bottom and the middle and top end. Though one of the initial aims in hifi improvement for many people is to get “more bass” – its something they feel they lack – the unintended price of more bass is leaching power from the other end of the spectrum – the top end. A lot of early improvements I made gave me more bass, but killed off the top end. The more that powerful bass was controlled, giving it dryer detail and texture instead of just boom, the more the other end of the spectrum is allowed to shine. More stuff that works, from the inspirational improver of hifi performance, Russ Andrews Accessories. This recommendation is based on personal experience, and no inducements offered, just things that work for me. Be warned, in certain quarters, especially among equipment snobs, the mere mention of his name will generate a patronising smile. I smile back, knowing it’s their loss.